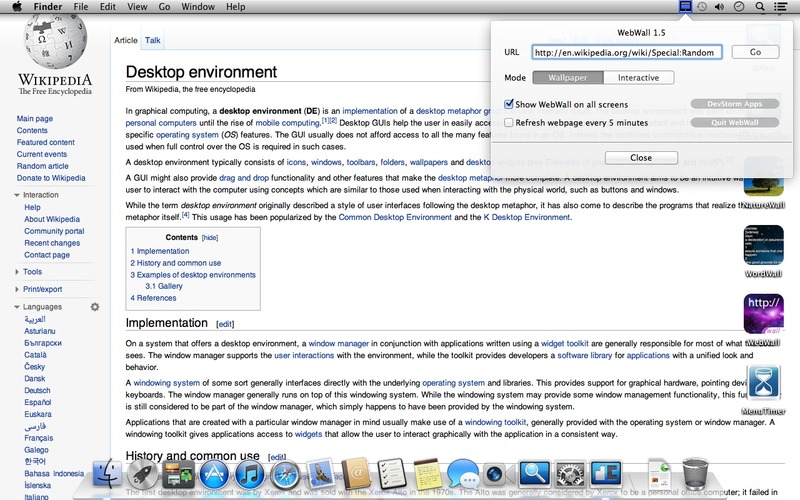 Display webpages on your desktop without a browser. Is there a better alternative to WebWall? Is WebWall really the best app in Desktop category? Will WebWall work good on macOS 10.13.4? WebWall shows web pages right on your desktop without interrupting your workflow. The pages shown on your desktop are not clickable, allowing you to control your desktop icons and widgets as usual. The main purpose of WebWall is to allow you to passively monitor certain website without requiring a web browser. WebWall needs a review. Be the first to review this app and get the discussion started! WebWall needs a rating. Be the first to rate this app and get the discussion started!